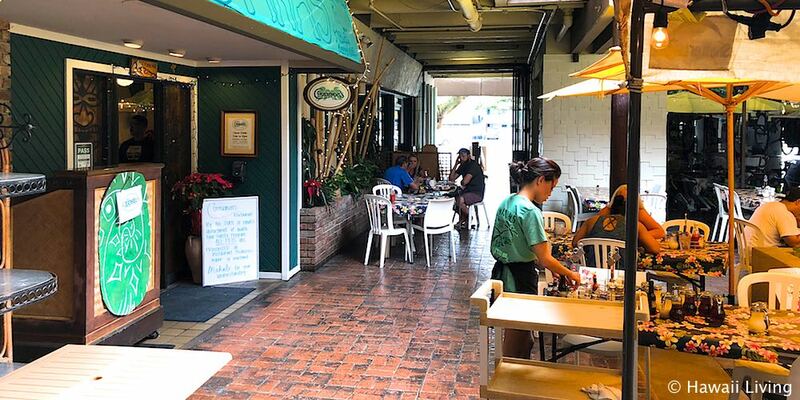 Waking-up in a Kailua home is a dream come true for many and what makes it even more special is to start the day right at one of the abundant great eateries serving fresh, locally prepared breakfasts. Residents know they can grab a different breakfast for every day of the week, and all at family-owned and operated eateries. Kailua is literally a breakfast bonanza. 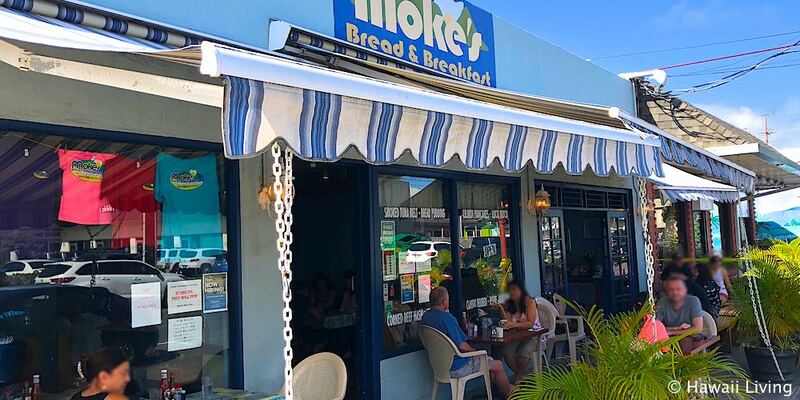 Moke’s Bread and Breakfast was established in Kailua in 1999, and in their own words, serves “food that reminds you of home.” Moke’s is named after its owner Moses “Moke” Warren who knows his craft. His rye and wheat bread and baguettes plus muffins and biscuits, are famous for a good reason. There is nothing better than freshly baked bread right out of the oven. In fact, all Moke’s dishes are fresh, not pre-made or frozen and many are family recipes generations in the making. Moke’s Lilikoi pancakes are the talk of the town! Made from scratch, these incredibly fluffy pancakes come in both a short or full stack. The sauce drizzled over the top of the pancakes uses lilikoi fruit from the Big Island. Short stack, full stack, or switch out the lilikoi for banana or plain pancakes, happy are the breakfast go-ers at Moke’s! Prefer French toast over pancakes? It’s all on Moke’s menu which also features at least eight different egg dishes. The farm-fresh omelets served with Moke’s amazing fresh breads are the perfect start to any morning, but Tuesdays, when Moke’s Bread and Breakfast is closed. Open all other days from 6:30 a.m. to 2 p.m., Moke’s is a winning choice for the entire family. The Warren family is even branching out as son, Keola Warren, has been overseeing and selling their own coffee under the Lanikai coffee label. Home-blended coffee, excellent service and an abundance of fresh food – there’s nothing to complain about other than a weekend line that can be a bit long – so the recommendation: go early! Oh, so ono! Perhaps the best gourmet breakfast grinds in Kailua can be scooped up at Over Easy. Over Easy, only open since July 2016, has already received accolades as one of the best up-and-coming restaurants and breakfast establishments on Oahu. Chef Nik and Jennifer Lobendahn – the quintessential power couple and both former Alan Wong’s alums – have a passion to make breakfast a memorable meal. They have succeeded! The breakfast menu provides classic and local Hawaii favorites with a unique spin. Try the Kalua Pig Hash with Okinawan potatoes, lomi tomato, OK Farm eggs, green goddess topping and cilantro (You’ll actually find pieces of meat in the hash); or the Brunch Bowl with avocado, soft eggs, house-made yogurt, spinach, tomato jam, candied bacon and Aiea fresh microgreens. Our family is split on our favorites: French toast (custard French toast coated with cinnamon toast crunch and served with orange crème fraiche); Kailua Eggs (OK Farm eggs, bacon cabbage broth, house-made Portuguese sausage and rice), and the Keiki (mini-pancakes, real maple syrup, and bacon). It really doesn’t matter what you order – you won’t go wrong and you certainly won’t go away hungry. The smallest out of the way bistro (just 32 seats), Over Easy can only accommodate up to parties of eight. They don’t take reservations and there’s no takeout so make the time to experience this fabulous foodie find and dine in or sit out on the lanai and have a thrilling experience for your morning taste buds. Breakfast (and lunch too) is served seven days a week (minus Monday). Over Easy is located in the middle of Kailua town off of Kuulei Road. It is pushed back from the main intersection a bit with a big secret that only Kailua residents know: This might be one of the few breakfast places in Kailua that serves libations like their Bloody Mary made from fresh tomatoes and topped with house-made pickled cucumbers and tomatoes on a skewer. One more local secret: Park in the municipal parking garage behind McDonald’s. And when you walk out of the parking garage, follow the little walkway on your right towards Kuulei Road and Over Easy will be there waiting for you. Puna and Cricket Nam founded Cinnamon’s Restaurant in Kailua umpteen years ago (1985) and are still going strong. An integral part of the Kailua community, the Nams were recently a big supporter of Kailua fireworks and were even able to be on the barge to set off the fireworks. At Cinnamon’s, winner of Honolulu Magazine’s Hale ‘Aina Award, First Place Gold for Best Breakfast on Oahu, you can count on fresh natural foods free from chemicals, preservatives and additives. They stick to the basics of good food at reasonable prices. Known for their red velvet pancakes, huge cinnamon buns and several varieties of Eggs Benedict, Cinnamon’s has been a favorite meeting place for generations. It’s the kind of place where the wait staff knows your name but welcomes newcomers with the same aloha Hawaii is famous for. 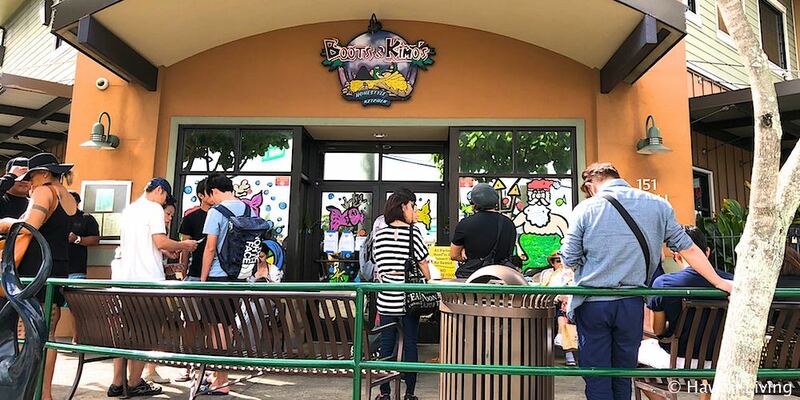 Tucked into a corner of Kailua Square closest to the entrance to Kailua’s municipal parking lot, you might find a line waiting to get in – but you can avoid the wait by making reservations. Cinnamon’s is open daily from 7 a.m.
You haven’t really lived in Kailua until you’ve hung out at Kalapawai for breakfast. Kalapawai Market, sometimes referred to as the local Cheers, is where locals and tourists mingle in the morning before hitting the beach. Go for a beach run, walk or swim and stop in for breakfast afterwards, where you can eat casually on picnic benches with your favorite deli breakfast sandwich to-go. Highly recommended are the breakfast wraps or breakfast burritos topped with Andy’s Bueno Salsa (another local resident, ‘salsa guy’ Andy Doka, is quite the hot shot when it comes to making the best salsa in the Islands). 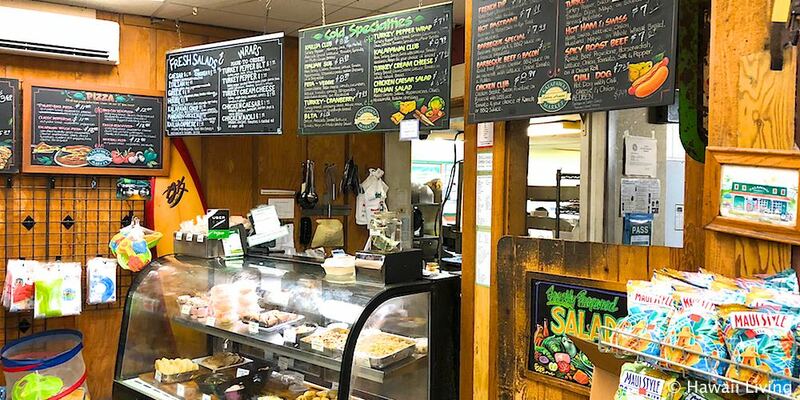 Kalapawai, located at the entrance to Kailua Beach Park for more than 85 years, is a fresh coffee, deli, great wine store and mini-market. It is truly one of the few remaining neighborhood stores in Kailua. Join their Kalapawai Coffee Club and get a free drink from their gourmet coffee menu after buying 10 cups of coffee. If you prefer to order a full breakfast served, stop in at Kalapawai Café in the beginning of Kailua town. Order your breakfast at the counter, and they’ll bring it to your table outside or inside if you prefer. 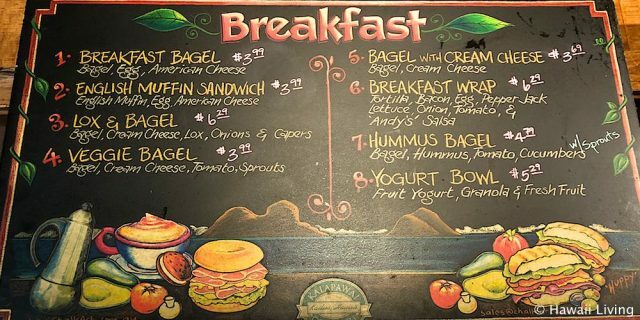 Try the bagel and lox, plentiful and reasonable! The kids seem to love the enormous chocolate chip muffins! Both establishments are run by Lindsey Dymond, who took over the restaurants from his late father, Don Dymond. Kalapawai Market breakfast menu is available from 6:30 a.m. – 7 p.m. The Café serves breakfast starting at 7 a.m. daily. No reservations are needed at either location. Just come and eat! Out of all the breakfast nooks, Morning Brew might arguably serve one of the best cups of coffee in Kailua. After all, Morning Brew, established by local couple Debbie and Peter Anderson, made it their mission to brew and serve the freshest, organic coffee possible. 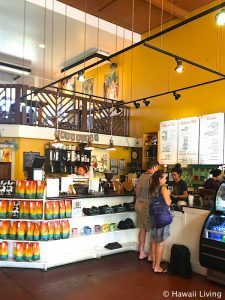 Located in the heart of Kailua, on Kailua Road in the Times Shopping Center, Morning Brew has been serving Kailua residents since1995. The first location was just a few doors down from its current spot and had a bohemian, funky atmosphere. Today, Morning Brew still features local artists and their works and often an impromptu jam session by local musicians. It just might be the first true coffee bistro in Kailua. It is really a treat to relax with a great cup of coffee and a tasty treat from Morning Brew. 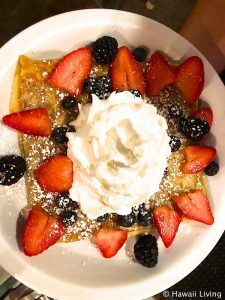 Favorites include the Belgium style waffles with whipped cream and fresh fruit, the works bagel or the smoked salmon bagel, house-made yogurt with granola and fresh fruit. Breakfast sandwiches, eggs and even a breakfast pizza round out the menu. The bistro also has a variety of vegan breakfast options such as the tofu and veggie scramble, steel-cut oatmeal with walnuts and fresh fruit and/or the fresh hummus bagel. Kid-sized portions of pancakes, fresh pastries and gluten-free options are all part of a varied menu. There are no reservations and breakfast is ordered at the coffee counter. Not to worry if you don’t see a seat when you walk in. Just head upstairs to the loft. Morning Brew is open Monday through Sunday 6 a.m. – 6 p.m. When a Frenchman told them that that Crepes No Ka Oi were the best crepes he ever had, Chris (from Tahiti) and Rosario “Kakay” (from the Philippines) Tarvyd were honored and surprised. Both were very fond of crepes before they even met. Together, they started Crepes No Ka Oi in 2008 because nobody was selling crepes at fairs and events on Oahu. Since they had nowhere to enjoy their favorite food, they decided to make their own and help everyone else fall in love with crepes. Crepes No Ka Oi serves all kinds of delicious crepes from savory to sweet and everything in between. A little secret: All of their dessert crepes are topped with their homemade fresh whipped cream! Yum! This unique restaurant is known for its ultimate breakfast crepe: melted Colby Jack cheese and a slow-cooked medley of potatoes, house-made bacon bits, onions, rosemary with two poached eggs and a side of house-made hollandaise sauce. But you’d better get there early because once it is sold out, you’ll have to come back the next day for more. Open daily except Tuesday from 7 a.m., at 143 Hekili Street, suite 130, in Kailua – parking is free on-street or in one of the two lots behind and to the side of their building. Boots and Kimo’s, which you cannot miss due to the line that often wraps around the front of their eatery on Hekili Street, is run by Kiakona brothers, Jesse and Rick. What started out as a dream to create a family-owned little restaurant has blossomed into a famous hot spot – a must stop and eat for both residents and tourists alike. You can tell by how many people are taking their pictures in front of the Boots and Kimo’s sign – indicating that yes, indeed, we ate here! The Kiakona brothers are both so much fun to talk to about their eatery and their humble beginnings and how they have turned into rock stars, especially for Japanese tourists. It turns out that a relative who lived in Japan bragged about his family’s little restaurant in Kailua. Over the years, word got around, especially about the amazing macadamia nut pancakes. It’s true: The pancakes are so onolicious that people travel halfway around the world just to savor the family recipe. The secret is in the very addictive sauce! Family is so important to the Kiakonas that even the restaurant is named after family members – Boots, for their father, whose dream to own a restaurant was never realized, and, Uncle Kimo, who brought in those family recipes all the way from Maui. Besides the amazing pancakes, Boots and Kimo’s serves home-style, big-portioned meals. Diners will enjoy local favorites like spam and cheese omelets, Portuguese sausage omelets, steak and eggs, homemade fried rice, and Hawaiian-style corned beef hash. A promise – you will not go hungry and yet, for some reason, will crave even more of that secret pancake sauce! Beyond the secret sauce phenomena and family recipes, the brothers really are most passionate about their collection of sports paraphernalia that now adorns their restaurant. This is not a themed chain restaurant; this is home-style fun and even more fun if you’re a Denver Broncos fan who just happens to live in Hawaii. The restaurant used to be a small hole-in-the-wall with a long line that was understandable due to the size of the establishment. Then the restaurant moved to the corner of Hekili and Hahani Streets and expanded in size, but so did the line outside the door. Best luck for those who are determined to get inside Boots and Kimo’s is to have a smaller party and go early! Another option is to take the newspaper and games for kids and catch some rays while you wait for a table. The only day you will not see a line is Tuesday when Boots and Kimo’s is closed. Boots and Kimo’s is open other weekdays from 7:30 a.m. to 3 p.m. and Saturday and Sunday, 7 a.m. until 3 p.m. If you haven’t found your perfect place in our picks above, then wake up with a mission. Keep breaking the fast and add to our list. Take a seat at Kono’s, Times Coffee Shop, Zippy’s, or Big City Diner. 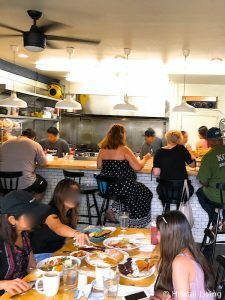 What better way to spend the morning in Kailua in a beautiful place with a belly filled with some of the best meals in Kailua – served, prepared and shared by fellow Kailua residents! ⇐ What’s New For 2018 Hawaii Real Estate?